So many holiday movies have been made over the years. But the nostalgic films of yesteryear have a certain flavor that just can't be duplicated. Case in point..."March of the Wooden Soldiers"...a timeless holiday classic. I don't know anyone (child or adult) who would not enjoy the climax of the soldiers marching thru Toyland or the scene where the single soldier runs amok in the toy factory where Stan & Ollie work and Santa Claus accidentally falls backwards into a toy drum and is laughing hysterically over the toy soldier destroying the factory. Then of courser there is Alastair Sim's "Scrooge". While the critics say this is too good to watch only for the holidays, which I whole-heartedly agree on, the scene where Scrooge first encounters the spirit of Christmas present I'm sure has a tendency to bring a smile to anyone's face. Who can resist laughing or at least smiling at the hearty laugh that the spirit gives off the moment the audience first see him? Then the scenes at the end when he wakes up Xmas morning and starts hopping all over his house like a little kid scaring the daylights out of his maid thinking that he has gone absolutely bonkers!!! Let's not forget the original "Miracle on 34th Street". It was always a laugh when I saw the mail carriers lugging the hoards of mail for Santa into the courtroom and piling everything on the judge's desk. What are YOUR favorite movie memories? Good thread topic, Rich. I'm sure as we progress into the holiday season and old members return, you'll see some hits on this thread. As for me, there are just too many favorite Christmas movie moments to mention. However, without a doubt "Scrooge" (aka "A Christmas Carol") with the great Alastair Sim is my all-time favorite, followed by "Miracle on 34th Street" with the great character actor Edmund Gwenn and "The Homecoming" with the wonderful actress, Patricia Neal. I guess if I had to give you one favorite poignant moment, it's the scene in "Scrooge" when the Spirit of Christmas Past (played superbly by Michael Dolan) takes Scrooge to the deathbed of his dying sister (played marvelously by Carol Marsh). Upon struggling to get the words out, which she just couldn't manage because of her weakened state, her brother (Scrooge) was motioned to leave the room. After contemptuously leaving the room and scornfully glancing at the newborn baby (his nephew), who's cry could be heard emanating from the next room -- and who Scrooge blames for his sister's death, the present Scrooge turns to the Spirit of Christmas Past with bitter indignation and rebukes him for bringing him to that room once again. That is, until he hears his sister faintly begin to speak again and utter the words that he had never heard so many years before because unbeknownst to her, he had already left the room. Those last dying words: "Ebenezer, dear brother, promise me you'll take care of my boy." The devastating news of hearing this last desperate, heartfelt request from the only person he had ever really loved was utterly heart wrenching to him -- especially because he had so utterly not fulfilled that request and had pretty much estranged himself from his nephew, never forgiving him for what he felt he was to blame. This scene never fails to bring tears to my eyes. Thanks for the positive response, Chip. Here's another of my favorite moments from "The House Without A Christmas Tree" starring the late Jason Robards as a widowed father who has a daughter that wants a Christmas tree but her father won't hear of it. Not even his own soft-hearted mother can persuade him otherwise. My favorite moment was at the end when the father came to his senses and finally brought home a tree if only to make hid daughter, Lisa Lucas happy. The daughter had no idea about him bringing a tree home in the first place. Once he brought the tree inside the house. She was almost in shock as her face would show and virtually speechless. I would have to say myself that the scene where Ebenezer Scrooge was with The Spirit Of Christmas Past at his sister's death bed. I always cry at that scene. The Alastair Sim is one of the better versions. Though I've seen most of the "Scrooge/A Christmas Carol" There is one where Marley's Ghost is in Scrooge's (previously Marley's) home, and the Constable, and I believe, the town crier are outside and Scrooge yells to them that there is an intruder in his house and he tosses the key down to them so they can get inside. I'm not sure who was in this version or what year it was released, but I believe it was B/W. There is even a version where Marley tells Scrooge that he will be visited by 3 spirits on 3 different nights and after it is all over and done, Scrooge, after he asks the boy outside, what day it is? says The spirits must have done it in one night. Miracle on 34th Street is another of my favorite Christmas movies. I don't remember if I mentioned this before here, but my mother told us when she was younger, she saw this movie at the theater and there was a scene that isn't in the current "Classic" That we have all grown to love and see on TV. The scene showed children picketing outside the courthouse. Edmund Gwenn is one of my favorite actors. He was also played an Entomologist in the movie "Them" Which was about Giant Ants. But his best role was as Santa Claus. I actually remember Alastair Sim's Scrooge being shown one holiday season along time ago on network TV and it was being introduced by the man who played Jacob Marley. During the commercial breaks he would also make a brief apppearance with words like.."We will be right back". Perhaps if i'm not mistaken, he might have even told about how certain scenes were even filmed as well....but I can't say for sure. Does anyone else remember this specail presentation? It's been a long time. Anyway, Christmas is right around the corner(hard to believe!). I agree with all the posts above, but I have to add "The Bells of St. Marys". A few scenes in particular (the Christmas play put on my the children), Bing singing "O Sanctissima" and "Bells of St. Marys", don't know why but the latter just gets to me, and the final scene where Sister Benedict is informed of the true reason for her reassignment, such a feel good moment! Hi Henry...I can't say that I have watched "Bells" in its entirety but Bing will always be defined as Mr. Christmas in my book. I always enjoyed the scene from "Holiday Inn" with Bing and Marjorie Reynolds at the piano singing White Christmas together. That was always the highlight of the whole movie. Whenever the movie was to be shown on network TV, that scene would be usually used as the coming attraction. I'm very embarrassed to say, as much as I love Christmas and Christmas Movies, I have never seen "Holiday Inn". I will, however, make every effort to see it this year. There's a lot of ground to cover here. Yes, that scene from "The House Without a Christmas Tree" is special. And the soft-hearted mother (grandmother to Addie) that you referred to was splendidly played by the great character actress, Mildred Natwick (one of the regulars of the John Ford Sock Company). Also, the presentation of "Scrooge" you were referring to with the intros and outros before and after the commercial breaks, was part of a special presentation done in 1989 to introduce the colorized version of "Scrooge." And yes, the actor who did the introductions was the one who played Jacob Marley, but not the old Marley (which was played magnificently by yet another great character actor, Michael Hordern). The actor who did these introductions was the one who played the young Jacob Marley (in the scene that took place in Mr. Jorkin's office when Scrooge is first hired). That actor was Patrick Macnee, who went on to later fame as the star of the great British TV series "The Avengers" in the 1960s. By the way, this special colorized presentation hosted by Patrick Macnee is currently availble on DVD. I have no recollection of that scene you described with the constable being in any theatrical film release of "A Christmas Carol." If there is a version where it does exist, it's a radical diversion from Charles Dickens story, as that scene is not even remotely in the book. "You will be haunted by Three Spirits. Expect the first tomorrow, when the bell tolls one. Expect the second on the next night at the same hour. The third, upon the next night when the last stoke of twelve has ceased to vibrate." With regard to "Miracle on 34th Street," I'd have to say that your mother was mistaken. I am a movie buff and a great fan of this film, and I have no knowledge of this scene with the children picketing outside the courtroom. If it did exist, you can be sure that by now it would have appeared on a special restored DVD. As for the wonderful Edmund Gwenn, he had so many great movie roles. Aside from his role in "Miracle on 34th Street," my other all-time favorite Edmund Gwenn role is the one he played in the original movie version of "Pride and Prejudice," where he was absolutely magnificent playing the father of the five girls. I like "The Bells of St. Mary's," but I would have to rank "Going My Way" far above it. "The Bells of St. Mary's" was actually the sequel to "Going My Way," which won the Oscar for Best Picture of 1944. And nothing could top that poignant final scene when Father Fitzgibbon (Barry Fitzgerald) sees his mother (who Bing Crosby's character, Father O'Malley, paid to have fly in from Ireland) after 45 years, and the tearful embrace that ensues. It's a real tear-jerker and it gets me every time. Though sequels are hard to pull off, and are usually not as good as the original, I thought they did a pretty good job on "The Bells of St. Mary's," with an almost equally touching ending. And yes, I would strongly recommend that you see "Holiday Inn" this year. Second to this, I would recommend "White Christmas," if you haven't seen it already. I did miss your response to my Jackie Gleason post and I just read it. As for the Constable and Town Crier, I may actually have it on a Beta or VHS tape, but they are hard to get at. I do specifically remember what I described where Scrooge had to toss his key out the window so the Constable could get in an find the intruder. (Jacob Marley's Ghost) When Scrooge told them there was a spirit in his house, I believe, he smelled Scrooges breath and sad something to the effect of Scrooge seeing things because he had been drinking. I haven't watched this particular tape in probably 15-20 years so my memory might not be as accurate as I remember seeing it. I don't believe it was a theatrical release, but I am not an expert on movies, though I do like several classic movies. One I haven't seen or been able to find was "Hot Rods To Hell" and I believe it starred Dana Andrews. but being this is a Christmas movie thread, maybe I could discuss this some other time. What I remember my mother telling me about Miracle on 34th Street was she actually saw it at the movie theater when it was first released. If that is the case, it could be long lost footage. I have the 2 DVD release from a few years ago with both the colorized and B/W version as well as a Made for TV version with (Uncle Billy from "It's A Wonderful Life" playing Santa Claus) I'm not good at remembering actors names. Chip, am I missing something or is it not possible to edit any posts that I've done? I wanted to add to my last post about a version of Scrooge/A Christmas Carol. Which version was it where The Ghost of Christmas Past. was just a voice? I don't remember actually seeing a figure for the first ghost in the version I am asking about. Grrr..... I feel light such an idiot. It wasn't the Ghost of Chritmast Past that was just a voice, but it was Jacob Marley's ghost. **Please use 'actions' drop-down box above post if you need to edit your message. What you could be remembering perhaps is some TV version of "A Christmas Carol." If you ever find the tape, my guess is that's what it will be. As far as a version where the Ghost of Marley is only a voice, I have no knowledge of such a version, but it sounds as bizarre as the version you thought you recalled with the constable and the town crier characters. Yes, Dana Andrews is the one who starred in "Hot Rods to Hell," he co-starred in the picture with the lovely Jeanne Crain (always one of my favorites). This film appears on television from time to time, especially on TCM. I guarantee your mother is mistaken about "Miracle on 34th Street." I have never read or heard of any lost footage from this picture. Nor have I read or heard any film historian mention lost footage, including the great Hollywood film historian, Robert Osborne. What's more is Darryl F. Zanuck (20th Century-Fox studio chief) was initially against making this film because he thought it might be too maudlin to succeed. In the end, he finally agreed to make the film at a modest budget. So I don't think director George Seaton would have squandered any money on a scene he wouldn't end up using. One of the reasons a film might be cut after its initial release is time management, but since this film only runs 96 minutes, that scenario seems highly improbable. Believe me, there is no such footage. As for Uncle Billy, he was played by legendary character actor, Thomas Mitchell. He was a staple in so many classic Hollywood films, and is best known today for playing the part of Gerald (Pa) O'Hara in "Gone with the Wind." Other big films were "Stagecoach," "The Fighting Sullivans," and "High Noon," which I have playing in the background on TCM as I write this post. Thomas Mitchell was a local boy, growing up in nearby Elizabeth, New Jersey. One last thing: I combined your previous three consecutive posts and explained at the bottom how to use the edit feature. If you should have any questions or difficulties, please let me know. Thanks for your cooperation. I'm quite sure that it was the 1938 MGM version of "A Christmas Carol" which had the constable and the town crier coming up to Scrooge's flat after he threw a key out the window to them. I have the colorized version on VHS and have made a transfer onto a DVD. As for Marley's ghost not being visible, that was in the 1935 film, "Scrooge". I have both the original British black and white version (78 minutes) and the edited colorized American release version (60 minutes) with different opening and closing credits on DVD. I hope this helps you. Hi folks...since i was the one who started this topic(and I'm surprised at how many responses there have been without even Halloween being over yet), I just wanted to toss an extra "throw in" to the topic. We don't necessarily have to talk about only favorite movbie moments. They can also be favorite moments from your favorite TV shows as well be they sitcoms, dramas, etc... Remember the long lost Christmas episode of "I Love Lucy" that was finally re-aired in the late 1980"s? Chip posted here the very touching scene from Scrooge involving his dying sister and her last request that he never got to hear. I agree this was a very sad and touching scene. What i liked was the touching scene in the movie "Chrismas Eve" starring loretta Young as a rich lady who finds out that she has an inoperable medical condition and realizes that her time may be short. Now she hires a detective so he can find her 3 grandkids and hope to have them visit her by Christmas eve and be reunited with their estranged father. The audience is kept in suspense until almost the very end when everybody shows up at her door and it's a beautiful scene with almost everyone letting out tears of joy. Aaaahhh nothing like being with your family for the holidays!!! Thanks loads, Jerry. I never would have remembered those scenes from these two versions. That's how long it has been since I've seen them. I'll have to watch them again -- just out of morbid curiosity -- if only to reacquaint myself with them and how bad they were. Susan, my advice to you is to leave the tape collecting dust in your attic! The 1938 version would have been so much better if MGM studio chief Louis B. Mayer and director Edwin L. Marin could have used Lionel Barrymore (one of my all-time favorite actors) for the role of Scrooge. But unfortunately, just before the picture was set to go into production, Mr. Barrymore had the accident that broke his hip. This not only prevented him from doing the film, but eventually left him bound to a wheelchair for the rest of his acting career. Nevertheless, even as a cripple, he was 10 times the actor of anyone who is around today. Lionel Barrymore was actually legendary for playing the role of Scrooge on the radio, from 1934-1951. Then, in 1952, MGM released an album version of the story on a 10" LP, where he reprised his role as Scrooge. I have it on CD, but I think it's out of print now. It was actually Mr. Barrymore who suggested to Louis B. Mayer that he use Reginald Owen for the role of Scrooge. Now don't get me wrong, I like Reginald Owen, but I did not like the way he portrayed the part of Scrooge in this movie. However, as I said in my post on June 21, 2008, the real flaw in this 1938 version is the adapted screenplay by Hugo Butler. For example, the scene where Scrooge fires Bob Cratchit on Christmas Eve for accidently throwing a snowball at him -- I mean, you've really got to be kidding. Then there's the scene that was actually the subject of my post last June, the major deviation from the book when Scrooge visits Bob Cratchit at the end of the story. This was probably the films biggest flaw and why it is one of the scenes (along with the firing of Bob Cratchit), that I have not forgotten. The one bit of poetic license that is a cardinal sin is to change the ending of a story. Again, as I said last June, all screenplay adaptations take poetic license with the story (which is essential because the book was actually a short story with a very basic plotline), but this was a real stretch. This is why it has probably been 20 years or more since I have seen this film, as well as the 1935 version with Seymour Hicks (which also had a poorly written screenplay) -- and as far as I'm concerned, it could be another 20. It is probably because I am such a fan of the book and the 1951 film version (which was the most faithful to the Dickens story) that I am so critical of the 1935 and 1938 films. And the sobering truth of the matter is that even if Lionel Barrymore had been able to do the 1938 film, it still would have been a weak movie because of its poorly written screenplay. By the way, for fellow movie buffs out there, this 1938 film included the entire Lockhart family: husband and wife, Gene and Kathleen, and daughter June (though she didn't get screen credit). June Lockhart is best known today as the mother in the campy TV series "Lost in Space"). Thanks for combining my last posts. I knew there was some way edit posts, just couldn't remember. I think my mother might have told us about the made for TV version with Thomas Mitchell. I'll have to watch the DVD again and see if that might be what she was referring to. Another favorite Christmas Movie moment for me was watching The Christmas That Almost with Rosanno & Lydia Brazzi and Paul Tripp. was when the children were bringing their pennies, etc to help Santa pay the rent. It was sad to hear that Rosanno passed away. I haven't heard anything about Lydia. I Actually remembered seeing the coming attractions to The Christmas that Almost Wasn't on TV commercials a long time ago. I think the movie was reshown in american theaters after its initial release theatrically overseas. I finally got to see the movie on Showtime when that was the only place to get to see it prior to its release on VHS. The movie looked so exciting when I saw the coming attractions but as an adult I was somewhat disappointed by what I saw but i still have a copy on DVD in my collection and watch it from time to time anyway. That's exactly right Susan; your mother was referring to the 1955 TV version of "Miracle on 34th Street," not the 1947 motion picture. And yes, Rossano Brazzi is dead; sadly, he died on Christmas Eve in 1994. As for his wife, Lydia, she died years before, in 1981. I just finished watching my own copy of "The Bishop's Wife", yet another holiday great that I believe is too good to watch only for the holidays. While the entire movie itself is a real fantasy, for me it's a toss-up on 2 favorite moments. The scene in the cathedral with the choir singing "O Sing To God". while Cary Grant helps to enhance their voices. Also the ending part with David Niven giving the sermon. A great sermon but it was clear that he knew that it wasn't the sermon he ORIGINALLY wrote but decided not to say anything. Cary Grant, who dictated to the typewriter what to write and being an angel sent from up above obviously had a much better sermon in mind than a Bishop down here! I think the scene that really captures the whole meaning of the film is the one where Dudley (Carey Grant) tells Debby (Karolyn Grimes) the story of David; it was touching when he delicately segued into the 23rd Psalm. And by the expression on his face, it was also evident that Henry (David Niven) was finally beginning to understand what Dudley was all about. One scene from the movie that definetly worth a bit of a chuckle is when Cary Grant keeps filling up the professor's (Monty Woolley) glass with Sherry without him even realizing what's going on until he decides to pour himself another glass not realizing that it was already filled magically. One brief moment involving Mr. Woolley looking at the full glass and then him and Cary Grant making eye contact at the same time with the expression on Mr. Grants face as to say, "Yes? Is something wrong? "A Very clever piece. Yes, the movie was very well acted. Not only by Carey Grant, Loretta Young and David Niven, but by all the great character actors that appeared in this one movie alone: Gladys Cooper, Jimmy Gleason, Elsa Lanchester, and of course, Monty Woolley. Then too, there was Sara Haden, who played Aunt Milly in all the Andy Hardy movies, and Regis Toomey who appeared in so many classic Hollywood films. In addition to all this, there was the appearance by the Robert Mitchell Boys Choir, who also appeared in the classic film, "Going My Way," with Bing Crosby. 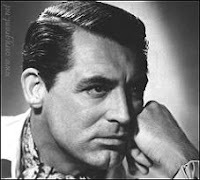 I've never seen that movie so I can't say, but that photo Chip posted looks more like Rock Hudson than Cary Grant to me. It does look a little like Rock; but no, that's good old Carey! They did have some similar physical features, but one couldn't even begin to compare Rock Hudson to Carey Grant. The Mitchell Boychoir also appeared in "The Babe Ruth Story" with William Bendix in the title role. No Rich, that's not correct; Bob Mitchell's choir never appeared in this movie. Sorry, Chip. I must have my circuits crossed somewhere! I could have swore I saw them in the opening credits but I guess not. Sometimes one's mind plays tricks on them. Anyway, I'm not sure what movie you might have been thinking of, but the biggest movies the choir made an appearance in were (in order of importance): "Going My Way," "The Bishop's Wife," and "Angels with Dirty Faces" -- although on the latter, they went by the name of The St. Brendan's Church Choir. Speaking of Jimmy Cagney and Cary Grant, I'm reminded of a Friar's Club roast of Cagney thirty-some years ago. (I didn't see it, but I heard from someone who did) Everybody including Cary Grant got up and did their impression of Cagney and they all said, "Ma's dead...you dirty rat!". The roastee, of course, gets the last word. Cagney got up and said, "I never said 'Ma's dead...you dirty rat.' What I said was, 'Judy, Judy, Judy!'" And he brought down the house. <?xml:namespace prefix = o ns = "urn:schemas-microsoft-com:office:office" /> By the way, in regard to richiedoo's post #6 above: I don't know if you knew or not, but Marjorie Reynolds lip-synched "White Christmas" in "Holiday Inn". Martha Mears recorded the vocal track. This is according to Jody Rosen in his book, "White Christmas: The Story Of An American Song", pg.106. **Please use ‘actions’ drop-down box above post if you need to edit your message. Thanks for that piece of info, JJ. Although it's not hard to understand that certain actors(actresses) cannot sing, it was still interesting to know that that was not Ms. Reynolds voice. Regardless, that scene will always be the highlight of the whole movie, although I enjoyed seeing Fred Astaire's tap dancing number with his exploding "poppers" that he used to enhance his performance. Talk about dubbing voices, although not a Christmas movie, in the Humphrey Bogart/ Lauren Bacall movie "To Have And have Not" the song that Ms. Bacall sings in the movie(I don't know the title) was actually the voice of Andy Williams! The event where Jimmy Cagney made those remarks was not at a roast as your friend has told you. It was at the AFI (American Film Institute) Salute to James Cagney ceremony that took place in Los Angeles in 1974. Here's exactly what Mr. Cagney said: "And, just in passing, I never said, 'Hmmm, you dirty rat.' What I did say was, 'Judy, Judy, Judy!'" Also, in the film "Holiday Inn," Martha Mears not only dubbed the singing voice for Marjorie Reynolds for the song "White Christmas," but for all the songs that Marjorie Reynolds sang in the picture as well, including "Happy Holiday," "Come To Holiday Inn" and "Abraham." In fact, she dubbed the singing voice again for Ms. Reynolds 4 years later for the 1946 movie, "Meet Me on Broadway." Martha Mears also dubbed the singing voice for such notable stars as Rita Hayworth, Veronica Lake and Lucille Ball. Also Mike, please note that in the future you can edit your message if you need to add something. This avoids superfluous posts on the board. The edit feature is in the 'Actions' drop-down box at the top of your message. Thanks. That is not true about Lauren Bacall in the movie "To Have and Have Not." Where are you getting this information? Please try to check your facts before you publically post it on the board; this pattern is becoming increasingly troubling to me. First of all, the song is "How Little We Know." Second, Betty (Lauren) Bacall sang it herself; it was not dubbed by anyone -- especially Andy Williams. When this movie was released on October 11, 1944, Andy Williams was only 16 years old! Actions drop-down. Got it! Speaking of Lauren Bacall singing, remember the picture of Harry Truman playnig the piano with L.B. sitting on top of it? I've read that Harry got in Dutch (boy, that expression sounds old!) with Bess for that--but it was L.B. doing her own singing there. Very true! It actually caused a bit of a scandal at the time for Truman. His wife Bess was so upset that she reportedly told him that she thought it was time for him to quit playing the piano. By the way, President Truman's daughter Margaret just passed away last January 29 at the age of 83. That picture of Truman and Bacall was taken on February 10, 1945 at the National Press Club in Washington D.C. when Harry Truman was still vice president under F.D.R. It was actually done as a publicity stunt; unbeknownst to Truman, Bacall was prompted to jump on the piano while he was innocently playing. Please be advised that the post that I made concerning the voice of Andy Williams for Lauren Bacall happens to be from a book about Humprey Bogart that I read a long time ago. That story was apparently a rumor which was found to be untrue thanks to the internet. You can see that this rumor was found to be untrue at www.imdb.com. If you type in the search box at that website "To Have And To Have Not" and read the message board for that movie, you will find that someone clarified that rumor to be untrue and that that myth was not something that I thought of my own mind. Fair enough, Rich. It just goes to show what I've always said: you can't believe everything you read! Without a doubt, when George Bailey gets his life back toward the end of "It's a Wonderful Life" is surely a great moment. ANd even when the Grinch's heart become 3 times to big is great. But I do have a question. For the longest time during the mid 70's to the early 80's, did WPIX air "Mr. Magoo's Christmas Carol" or was it another local New York station? Hello Lenny, and welcome to the board! Yes, it was WPIX that used to broadcast "Mr. Magoo's Christmas Carol," and it was usually right around Thanksgiving. By the way, that's a beautiful child you have; you must be a proud papa. I can name TONS from that movie, but when I was young I was obsessed with that scene. That's just for starters. But, probably my fave Christmas moment in a "regular" movie is from FEMALE TROUBLE, when Dawn Davenport (Divine) gets upset on Christmas morn because she didn't get Cha-Cha heels like she asked! Caution, there's a bit of profanity in this clip! Another one...the opening credits to "Gremlins" (Well it DID take place during Christmas! :-)) You get the seedy, underground prologue...and then it explodes into the snowy white scene of Kingston Falls, with "Rockin' Ricky Rialto" (Don Steele)...and most of all, Darlene Love singing "Christmas (Baby Please Come Home)." Brilliant! Always nice having the classics on DVD (Mr magoo, Charlie Brown, Its a wonderful life, going my way, etc)! get to watch them when my schedule permits ;-) There is one scene in It's a wonderful life that always cracks me up. it's when George goes with the angel into Nick's bar. During the back & forth, Nick gets mad and says "We serve hard liquor to men that want to get drunk quick!" Always a laugher for me LOL! I will take "Home Alone" anytime! I wouldn't be surprised if the over-whelming success of the movie would eventually inspire it to become a Broadway hit. Favorite Christmas Movie Moment ? "Mr. Gower cabled you need cash. Stop." up to twenty-five thousand dollars. Stop." to my big brother George. The richest man in town!" The movie itself is one of the greatest, but those 2 lines at the very end of this long movie choke me up every time, watch the look on Georges face after these lines are spoken, and you'll know what I mean. I'd like to continue Top Cop's favorite Christmas movie moment... While George is holding Zuzu, a branch of the Christmas tree is shaken causing a little bell ornament to ring. That's when Zuzu says, "Look, Daddy, teacher says, 'Every time a bell rings, an angel gets his wings.'" Then, there's that last scene when George reads what Clarence wrote in a book... something like, "No man is a failure who has friends." I always liked the scene in Miracle On 34th Street where the little Dutch girl who can't speak English sits on Kris' lap. She's thrilled that Kris can speak Dutch and they sing a Dutch Christmas song together, to the amazement of the woman who brought her as well as Natalie Wood watching nearby. That scene with Edmund Gwenn and Marlene Lyden in Miracle On 34th Street is one of my favorites from the film as well. In case anyone is interested, I thought I would post below the lyrics to the Dutch song they sang together, and then the English translation. By the way, in a recent conversation I had with Alvin Greenman (who played Alfred in the movie), we were talking about Marlene Lyden. She just died just four years ago in Las Vegas where she had been a real estate agent for many years after retiring from acting. Marlene Lyden, huh? OMG! What a wealth of information Chip has! Now we can all sing along with that song, too. Thanks, Chip. Also, thanks for mentioning Alvin Greenman. I've been meaning to research the actor who played Alfred. I can't remember his exact lines from the film, but there's one scene where he's talking to Kris - I think he has a broom in his hand, if I'm not mistaken. Anyway, he expounds on all the commercialism surrounding Christmas. That's a fascinating scene when you consider that was 1947. Every time I watch it, I think his words are just as true today, perhaps more so. Just a little tidbit about Alvin: that Brooklyn accent he used for his character in the film was a testament to his acting chops, as he was a native of Manhattan. He pulled it off well. By the way, Alvin is now 81 and retired and lives in Van Nuys, California. His wife of 54 years passed away 8 years ago, but he has two wonderful children, a son and a daughter, that are a joy in his life. Well, Chip, the next time you talk to Alvin, you can tell him there's at least one person on whom he made a lasting impression with that one little scene. I'm sure a lot of others feel the same way. I've been meaning to give Alvin a call lately, and your message was an added incentive for me to finally do just that. Anyway, I told him what you said in your post and he said he truly appreciated it. He's glad some of his work in films still resonates with people today. Alvin loved making Miracle On 34th Street and has many fond memories of making the picture. He loved Edmund Gwenn, John Payne and Maureen O'Hara and said they were the nicest people to work with. He also said that John Payne was particularly kind and even had him over for dinner and gave him invaluable tips on acting, which he used throughout his acting career; although, most of his later work in Hollywood was behind the camera as a script supervisor and dialogue/dialect coach. Another movie he really enjoyed making was Mr. Belvedere Goes To College with Clifton Webb, Shirley Temple and Tom Drake. Some of the films to his credit as a script supervisor were The Longest Yard, Airplane II, The Karate Kid and the TV series Doogie Howser, M.D. and Hearts Afire. I remembered the scene... it was Alfred's "Make a buck, make a buck" speech. OK, I cheated and looked it up. But thanks for filling us in on Alvin's subsequent work. To this day, that remains one of the greatest Christmas movie moments. Yes Jim, it is a great moment. No way! That's too funny.